Mowin' & Throwin' is an insane 2 vs. 2 local multiplayer game featuring lawn-obsessed gnomes who drive riding mowers! Each match is a constant tug-of-war as you work with your teammate to mow your lawn and sabotage the other team's lawn. The team who has the least amount of grass on their lawn when time ends, wins! Matches tend to be very close, so don't be surprised if you and your friends get excited and start yelling at the screen! If you are a fan of local multiplayer favorites like Overcooked, Lovers in Dangerous Spacetime, Gang Beasts, or Crawl you'll have fun with Mowin' & Throwin! 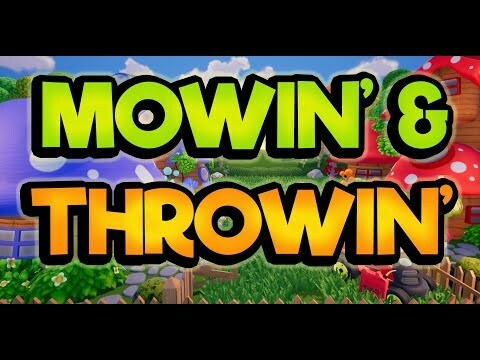 Mowin' & Throwin' was released on PC (Early Access) 268d ago in the US and the UK. Notify me when Mowin' & Throwin' is available.